Maciré Sylla, whose family belongs to the Soussou ethnic group, was born in Conakry, Guinea. Her mother was a very young artist when she was born, so Maciré’s upbringing was entrusted to her maternal grandmother, who lives in Tayiré. This village of a few hundred inhabitants lies on the edge of a lush forest and overlooks a vast flood plain with rice fields stretching as far as the eye can see. In West Africa children and adolescents generally gather in the evenings after their day’s activities to talk, laugh, dance and sing together, but also to share their problems with other members of their own age group (sèrè). Maciré’s love for music and dance showed at a very early age, when she would pit herself against the other children in the village. At her mother’s request she returned at the age of ten to Conakry to continue her studies. It was at that time that she discovered the dance company Soleil d’Afrique, which came as a revelation to her, and soon after that she left school to devote herself intensively to acquiring skill in music and dance. After some reticence at first, her mother had to bow to Maciré’s determination, and finally she accepted her daughter’s chosen path. There were numerous dance groups at that time in Conakry. Young talents were recruited throughout the country and virtually obliged to move to the capital, where fierce competitions were organised between the various regional dance companies and orchestras. The young recruits, sharing the same aesthetic ideal, were trained and also immersed in the myths and mysteries that form the foundation of their culture. Maciré Sylla soon became the principal dancer of the company Soleil d’Afrique. After rehearsals she would attend the sabar, doundoumba and other musical events that punctuated the daily lives of the inhabitants of Conakry. And every day she would sing and dance until late at night, thus earning enough to provide for her own needs and those of her family. Maciré Sylla was trained at this school: her fame as a singer began in the streets of Conakry, away from the great professional orchestras such as Les Ambassadeurs, Les Amazones de Guinée or Bembeya Jazz. Although she does not come from a family of griots, Maciré Sylla is now recognised as a traditional singer by the people of Guinea. Indeed, for a long time music was the privilege of Manding (Malinke in Guinea) musicians, and particularly of the griots. It was very rare for a musician of Soussou origin – whose culture is historically connected with the Manding empire, but is not recognised as such by the Malinke – to obtain recognition as an artist, let alone as an international artist. 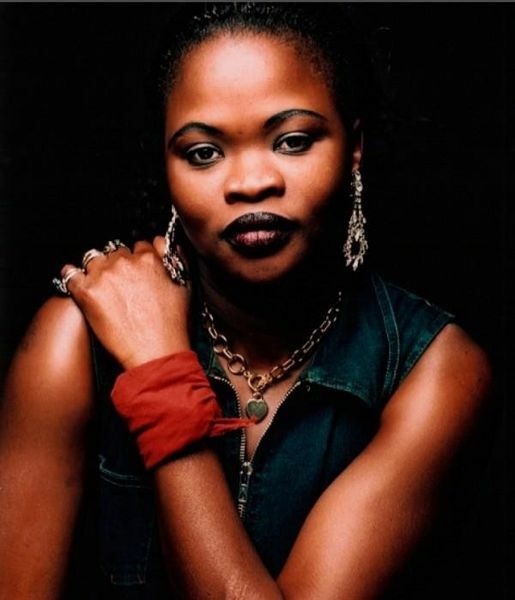 In 1989, when she was taking part in a competition at Conakry, Maciré Sylla was noticed by Bruno Camara, the founder of Africa Djolé, the first West African percussion group to earn recognition in Europe. He selected her for his group Fatala, which was based in the Netherlands and Maciré toured with them all over the world from 1988 to 1992 . On her return to Guinea, Maciré met Cédric Asséo, a Swiss musician who became her husband. Together in 1994 they formed the ensemble Djembé-Faré (‘Drum-Dance’). Their first recording, Mariama, released in 1997, was an immense success throughout West Africa (200,000 copies sold in three months). As a result, the following year Maciré was hailed as Guinea’s best singer. Maciré’s second CD Maya Irafama was published worldwide in 2000 by Trace/BMG and got fantastic reviews. Maciré then released Sarefi (‘Reward’) in 2004 by Arion/Ethnomad and Massa in 2005. By giving a modern treatment to music and lyrics of Soussou origin, this “non-griot” singer of Basse- Côte enjoys an astonishing success in her country. Being herself from both side of the social spectrum, the city and the countryside, Maciré’s aim is to make a fusion of those worlds. Her sound is eclectic, straightforward Afropop, and brings in influences from reggae to electric pop music. Traditional and modern instruments combine with Macire's soulful voice and mix beautifully. Maciré Sylla’s new album “Talitha” has just been released in late 2010.